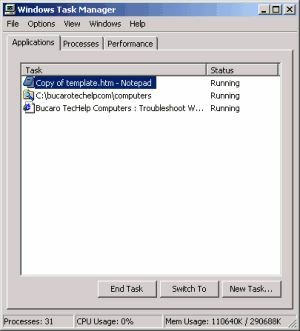 Task Manager is a Windows system utility that displays the tasks or processes currently running on your computer. To open Task Manager, press Ctrl+Alt+Del. The Applcations tab lists the applications currently running on your computer. A single application may actually consist of several running processes, and many programs that run in the background are not listed (you can see icons for some of these programs in the System Tray). Note: With Windows 98 and Windows Me, Ctrl+Alt+Del will open Program Manager, which allows you only to close aplications. However, you can download one of the many Task Manager utilities from the Web. The Processes tab displays a comprehensive list of all the processes currently running on your computer. This can be very useful for monitoring your system. The Processes tab displays information about the processor useage and memory usage of each process. The problem is, how to identify a process. Below is a list of some processes you may see in Task Managers Processes list. System Idle Process is basically another name for the time when Windows is doing nothing. There are hundreds of thousands of processes that run on a computer, so you will definitely find names of many other processes that are not listed above. You can also learn about almost any task by using it's name as a search term in google.